A brand new 40 bedroom care home situated in Braintree Essex. Riverdale is a luxurious home, equipped to offer residents the complete care package. Overlooking the River Brain, Riverdale is set in natural and tranquil surroundings. The home is also built according to dementia care best practice; a central circular corridor provides a continuous path around a secure sensory courtyard. There is something for everyone at Riverdale – a Café and traditional pub area for catching up with friends and family, a potting shed for keen gardeners, hair salon and spa for when some pampering is in order as well as many more amenities to enjoy. All areas of the home reflect a homely, calming environment for residents, drawing inspiration from the beautiful surroundings. EMCE carried out the complete Design & Build for the Mechanical & Electrical services to the new care home. Working closely with the end client, architect and main contractor to create an end product that was aesthetically pleasing and considerate to the residents as well as being practically functional for the general day to day running of a busy healthcare facility. 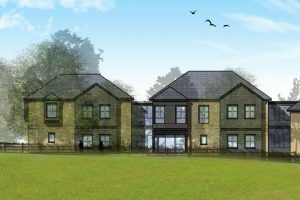 The success from this has led to us being engaged to work on another new care home facility due to start early 2019!